LoP opened up a dark and dreary bungalow kitchen to accommodate it's new owners who are a fun, energetic couple who love to entertain. LoP created the new layout and guided design selections including cabinets, hardware, lighting, ceiling, and flooring. A new concept writing studio in Nashville, called Secret Genius. 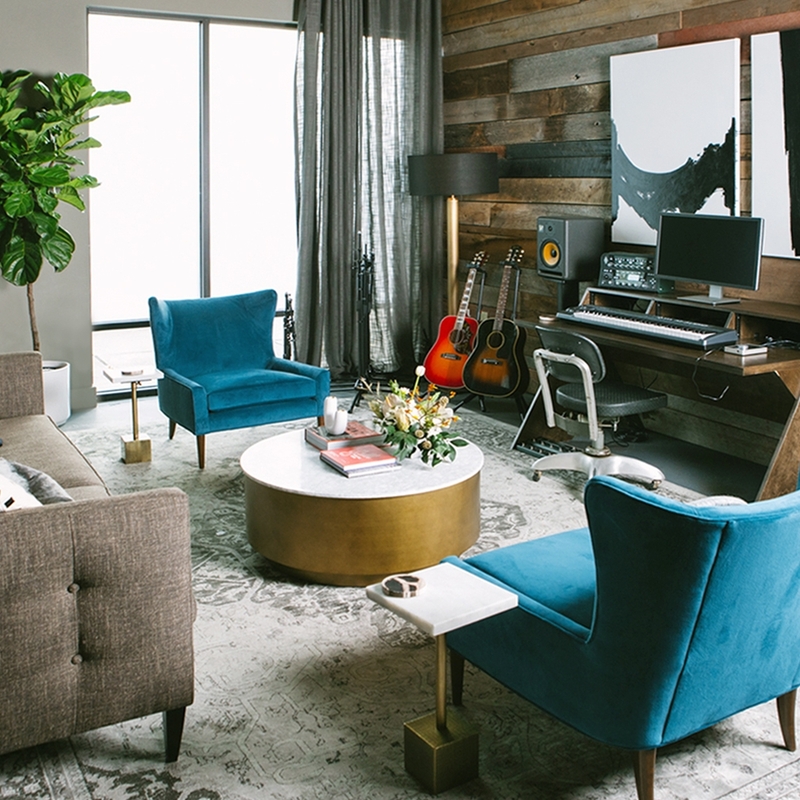 Created by Spotify as an inspiring space for Nashville's biggest songwriters. Features original art by local artist Angela Allen, rock-photographer David McClister, and a custom painted piano by Alic Daniel. For this marriage and family therapy practice, the focus was to create a calming atmosphere to help clients feel comfortable and provide them with an environment that encourages intimacy and growth. Located in the historic Lockeland Springs neighborhood of East Nashville, LoP re-imaged how each room would best be used for entertaining and everyday living. Interior styling was inspired by time spent in California featuring mostly white walls and unique vintage furniture that gives a sense of history. This standard apartment was transformed into a calming retreat with eclectic furnishings that reflect the Nicaraguan roots of the resident. With the goal to upgrade this standard builder spec home, farmhouse accents were given to this new build in the Shelby Hills neighborhood to make it the perfect blend of historic charm and modern amenities. All building specs and interior styling were done by LoP. This brand new mid-century style cabin in upstate NY was built to be a calming getaway for a busy couple who spend their work week in the city. All building specs, design selections, and interior styling were done by LoP.